I’ve received so many direct messages on Instagram asking about my favorite baby products. And now that I’m officially a parent of two newborns, I thought it would be helpful to do a round-up of my Top Ten Newborn Baby Essentials. I’m by no means an expert as I’m still navigating the wonderful journey of parenthood, but I did want to share some insight on what has really helped me acclimate to becoming a mom of twins. I hope you find it useful as these items also make great gifts for parents-to-be! 1. DockATot – The ultimate docking station for your baby. This is an essential in our home as we currently use this when we want our twins to hang out on our bed or rest on the couch. It keeps them safe and snug and it’s approved by pediatricians. You can find more styles here too! It’s also important to make sure they are not left unattended when on the DockATot! 2. Boppy – Bop over to the store and buy this. One of the most important things after feeding a newborn is holding them upright as their bodies are still learning how to digest milk. The Boppy saves me from having to hold them up while I tend to the other baby (or another task such as pumping milk, respond to emails, etc). It’s been a real savior and something I really recommend. 3. Medala Symphony Breast Pump – Enjoy sore, chapped breasts, constant sleep deprivation, and being a human Whole Foods for at least a year? If no, then invest in a breast pump and I’m strongly recommending a hospital grade pump. I didn’t realize how long it takes to pump milk (especially for two), so you want to use that time as efficiently as possible. Hospital grade pumps are much stronger and more efficient, cutting out pump time. They usually retail for $2,000-$3,000, but we rent ours monthly from the hospital for about $75 a month. That’s probably why many refer to breast milk as “liquid gold”. 4. Dohm Sound Machine – The sounds of silence is what you’ll get with this handy machine. Our night nurse and many friends who have kids recommended this particular model as it emulates what the babies heard in the womb and also provides a calming mechanism so that they can sleep. We have one in our bedroom and nursery and noticed it really does work to make our twins sleep better. 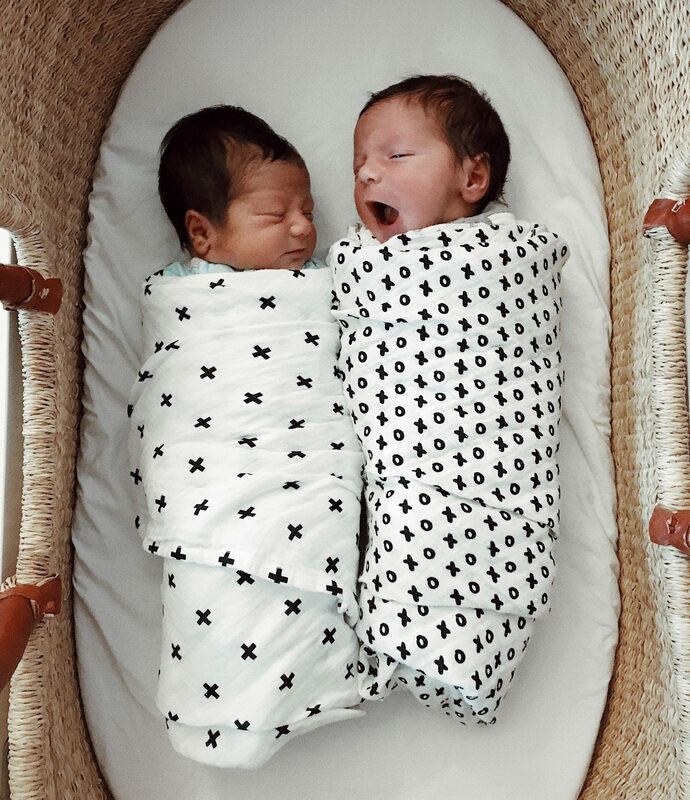 It’s no surprise that babies love being swaddled. But babies also want to look good (kidding, but it is fun to dress them up). I’ve discovered that Aden & Anais and Nordstrom make grade swaddling blankets made from breathable muslin cloth. I’m underscoring breathable because it’s critical that you purchase breathable swaddles and blankets that allow the baby to breathe in the event it rides up and covers their faces. It’s a huge concern I had as a new parent. With the aforementioned brands, I can be rest assured that the air around them is circulating. Swaddle blankets also make fantastic gifts. Modern Burlap also makes some great swaddle blankets and they don’t fade! 6. Gas Drops and Gripe Water – This is the tequila of baby world—it makes everything better. Some newborns will develop digestive issues like gas and acid reflux because their bodies are getting used to breast milk and formula and just the ability to digest food out of the womb. My twins have had these issues, which is normal, so these were especially useful to have on hand. Gripe water has also been a savior especially when they get hiccups. 7. Water Wipes – Like getting poop on your hands? Probably not so you will need to have wipes handy during those many diaper changes. But babies have very sensitive skin, especially their bums, so you have be be cautious about what you use when cleaning that area of their body. The wipes they used in the hospital made their bums pretty red and would have created a pretty awful diaper rash. With this in mind, we reverted to using only water wipes which is contains 99.9% purified water and a drop of fruit extract making it super sensitive and safe for newborns. Be sure to pack some in your diaper bag as well. 8. Pampers Swaddlers and Honest Diapers – My husband laughed when a good friend sent ten gift-wrapped boxes of diapers in different sizes. “This is a strange gift”, he said. It wound up being the best baby gift ever and we’re so thankful to his friend for having the foresight to get us that essential item. Diapers seriously make the best baby gift and I can’t tell you how fast we are going through them! I love the patterns and designs of the Honest Baby ones. Both are great options! 9. Diaper Genie – “I’m a genie in the bottle, you gotta discard me the right way”. You will notice your trash will fill each day with diapers, and if you’ve been around them, you probably know they don’t smell great. And if you discard them in your trash, they can begin to smell. So unless you plan to take out the trash every thirty minutes, invest in a diaper genie. It’s the ideal way to discard used diapers and the rubber seal locks in all the odors so your nursery smells baby fresh. 10. Dr. Brown Bottles – We’re down with Dr. Brown. We love these bottles because of they developed a unique “vent” which paces and even slows the flow of liquid that they digest to make it more palatable for their digestive tracts. This is a must-buy item. We love this bottle warmer and sanitizing system too! I hope these Top 10 help you whether you have a little one on the way or a newborn at home. These also make terrific baby gifts that any new parent (and baby) will appreciate. I’ll be following up with some more tips so stay tuned. Now back to cuddling these cuties. Yes, Joana. They definitely should NOT be left alone. Thanks!